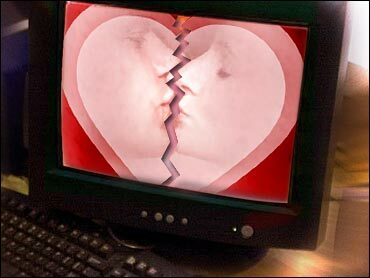 Offering a simpler and cheaper path to divorce, an ever-growing array of dot-coms, computer-savvy lawyers and state court officials are encouraging unhappily married Americans to arrange their breakups online. For fees ranging from $50 to $300 - a small fraction of what most lawyers charge even for an uncontested divorce - couples are being provided with the appropriate forms and varying degrees of help completing them. The phenomenon is spreading. Rival firms CompleteCase.com and LegalZoom.com each say they have served 20,000 clients nationwide in less than three years of operation. Hits on the divorce section of the California court system's do-it-youself Web site soared from 6,800 in May 2002 to about 15,000 last month. "It's similar to the growth of online travel services and online stock trading," said Brian Lee, president of Los Angeles-based LegalZoom. "People are learning they don't need a travel agent or a stockbroker or a lawyer - they can do it themselves." Many clients may still have to appear in court, but - in theory, at least - they will have all required paperwork with them and will be able to represent themselves. "For me, it was a purely economic decision," said John Chang, 33, of South Pasadena, Calif., who paid LegalZoom $300 to help him obtain an uncontested divorce last year. "I filled out the forms in the course of a night - it took three hours - and saved $2,000," he said. "When you don't have children or a lot of assets, it's the way to go." But reactions to the trend vary. Some religious leaders are dismayed that divorce can be made even easier. The American Bar Association wants to ensure that dot-coms don't engage in the unauthorized practice of law, and is studying how its members can serve divorcing couples without high fees. "A lot of what's happening is a very understandable rebellion against how expensive it is to go through the court process," said Sandra Morris, a San Diego lawyer who is president of the American Academy of Matrimonial Lawyers. "Divorce lawyers view online services the same way doctors view self-help health books," she said. "If it's a minor problem, maybe it's OK to use over-the-counter remedies. But if there's any possibility of it being more complicated, it's a substantial risk to do it yourself." The do-it-yourself services acknowledge that online divorce doesn't work when spouses disagree on any substantive issue. Linda Elrod, a professor at Washburn University School of Law in Topeka, Kan., said couples who have children, complex finances or even a pension plan to be divided should consult a lawyer. Even in a supposedly uncontested online divorce, each spouse should be cautious, Morris advised. "Very often in a marital relationship, there's not a complete balance of knowledge and power," Morris said. "In an effort to settle in an amicable way, they may be settling more in one person's way than the other." Some dot-com services simply provide forms for clients to fill out - MyLawyer.com, for example, charges $49.95 for most state divorce forms. CompleteCase gathers information from clients through its own questionnaires, and its employees then complete the official forms for $249. "When it comes out of your computer, it looks like a lawyer prepared it," said CompleteCase CEO Randy Finney. The major online companies all state on their Web sites that they are not law firms and don't sell legal advice. However, the ABA's eLawyering Task Force has questioned whether some online clients may falsely conclude - based on sales pitches - that their divorce forms will undergo substantive review by a lawyer. Richard Granat, a Maryland attorney who founded MyLawyer.com, says the ABA should encourage its members to provide less expensive, divorce-related services that can compete with non-law online companies. Trying to force online divorce outfits out of existence will just reinforce the "negative image of the legal profession," he said. Finney, an attorney himself, said traditional divorce lawyers shouldn't be worried by competition from companies like his CompleteCase. "The bread and butter for divorce lawyers is the contested case, where the fees start at $3,000, $4,000," he said. "A little uncontested case is not that big a piece of the action." For leaders of the Marriage Movement - a coalition of religious and other groups seeking to promote strong marriages - online divorce is part of a lamentable trend. "Almost everything we've done in the last 200 years has made divorce easier," said Mike McManus, founder of a Potomac, Md., organization called Marriage Savers. "You want to slow down the process, not speed it up."